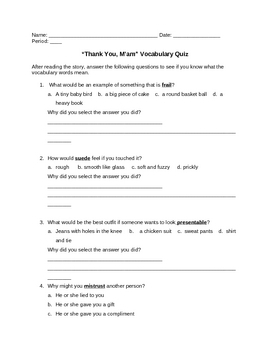 Use this vocabulary quiz to see if your students know what the vocabulary words mean in Thank You, Mam, a short story by Langston Hughes. Answers included! 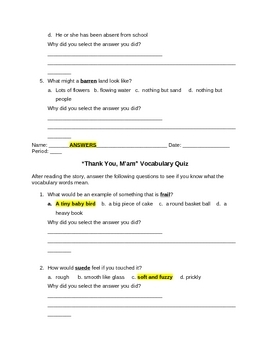 Intended to be used after reading, it includes the words used in context with multiple choice and a spot dedicated for students to explain why they selected the answer they did. This document is also available in the Thank You Mam All-in-One DEAL.